Last week I was at a new restaurant in Edmonton called Rostizado, which is a Mexican rotisserie place with great ambiance and amazing food. Surprisingly enough, we did not try the rotisserie (next time), but we did try a deeply flavourful Aztec soup. Ever since that night, I have been craving a soup as soulful as that one was. This recipe is not a reproduction of Rostizado's soup, but it is a comforting bowl of Mexican flavours that warm the heart and the soul on a cold winter's day. 2. Toss onion, tomatillos, and peppers in 1 Tbsp of oil and roast on baking sheet for 25 - 30 minutes turning halfway through cooking. 3. Combine roasted vegetables with garlic and 1 cup of chicken stock and puree in a blender or food processor. 4. In a 6 quart slow cooker, combine skinless chicken thighs, blended vegetables, crushed tomatoes, remaining 5 cups of chicken stock, cumin, oregano, salt, pepper, and bay leaves. Cook on low for five hours. 5. Add hominy (or corn or beans) and lime juice and cook for an additional 30 minutes. 6. Remove the chicken from the cooker and shred using two forks. It will be very tender and fall apart. Return it to the soup. 6. 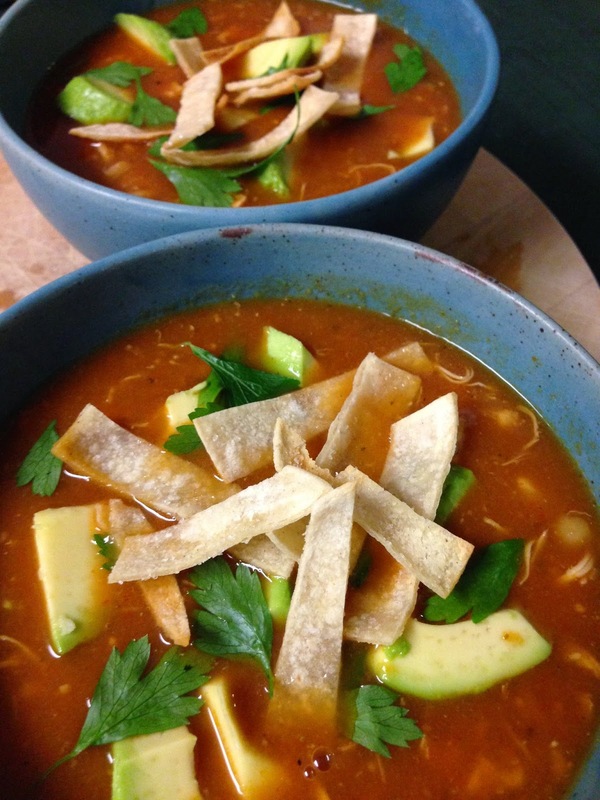 Serve soup with avocado, cilantro, and tortilla chips. Enjoy! 2. Brush corn tortillas with oil. 3. Cut tortillas into strips, place on baking sheet, and sprinkle with salt. 4. Bake for 6-8 minutes. 1. Hominy is a white corn that is treated with lime and salt. It is chewier and starchier than regular corn. It can sometimes be found in regular grocery stores, but I buy it at the Mexican grocery store a block from my house. If you are not using hominy in this recipe, use half corn and half black beans. 2. Fresh corn tortillas will be found in the deli section of the grocery store. They are very different from the flour tortillas in the bakery section. If you would like to make homemade tortilla chips, simply cut them in quarters. They are great with salsa. 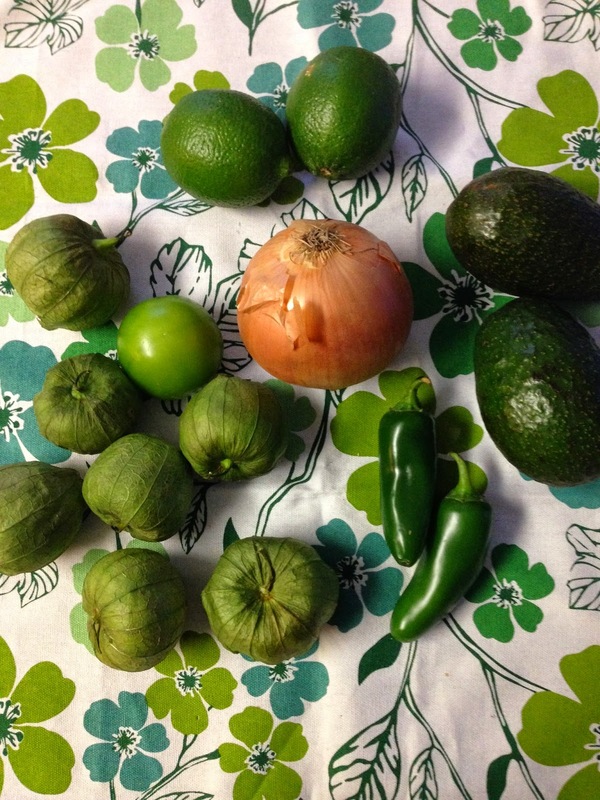 I've never seen those tomatillos before - thanks for introducing them to me! My pleasure! They really have a nice bright flavour.